Around 6 a.m. March 2, CHAMP captains from participating schools revealed the event’s final tally of $61,547.35. Huntingdon County Commissioners Mark Sather, Scott Walls and Jeff Thomas, plus county chief clerk Heather Fellman joined CHAMP captains on stage to sign a proclamation declaring March 1 “CHAMP Day” in Huntingdon County. CHAMP dancers and sponsors raised over $61,000 for local families over the weekend, hitting a five-year total of $200,000. 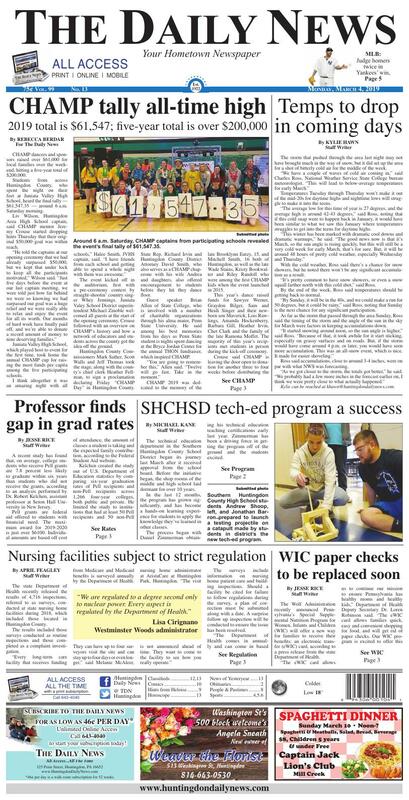 Students from across Huntingdon County, who spent the night on their feet at Juniata Valley High School, heard the final tally — $61,547.35 — around 6 a.m. Saturday morning. Liv Wilson, Huntingdon Area High School captain, said CHAMP mentor Jeremy Crouse started dropping hints Thursday that their original $50,000 goal was within reach. Juniata Valley High School, which played host to event for the first time, took home the annual CHAMP cup for raising the most funds per capita among the five participating schools. The event kicked off in the auditorium, first with a pre-ceremony contest by straight-shootin’ country singer Whey Jennings. Juniata Valey School District superintendent Michael Zinoble welcomed all guests at the start of the opening ceremony. Crouse followed with an overview on CHAMP’s history and how a network of educators and students across the county got the idea off the ground. Huntingdon County Commissioners Mark Sather, Scott Walls and Jeff Thomas took the stage, along with the county’s chief clerk Heather Fellman, to sign a proclamation declaring Friday “CHAMP Day” in Huntingdon County. State Rep. Richard Irvin and Huntingdon County District Attorney David Smith, who also serves as a CHAMP chaperone with his wife Andrea and daughters, also offered encouragement to students before they hit they dance floor. Guest speaker Brian Allen of State College, who is involved with a number of charitable organizations through his alma mater, Penn State University. He said among his best memories from his days as Penn State student is nights spent dancing at the Bryce Jordan Center for the annual THON fundraiser, which inspired CHAMP. CHAMP 2019 was dedicated to the memory of the late Brooklynn Eutzy, 15, and Mitchell Smith, 16 both of Huntingdon, as well as the late Wade Stains, Kristy Bookwalter and Riley Randoll who were among the first CHAMP kids when the event launched in 2015. This year’s dance raised funds for Sawyer Werner, Graydon Bilger, Sam and Heidi Singer and their newborn son Maverick, Lois Rawlings, Amanda Hockenberry, Barbara Gill, Heather Irvin, Chet Clark and the family of the late Ramona Moffet. The majority of this year’s recipients met students in person during the kick-off ceremony. Crouse said CHAMP is leaving the door open to donation for another three to four weeks before distributing the funds. He said the families are free to use the money is any way that lessens their burden during medical treatment. “I know we have helped with doctor bills, mortgage payments, energy bills, gas and toll booth costs, oxygen tanks, funeral costs, food, medicine that insurance won’t cover and just everyday living expenses,” he said. He pointed out that in the months leading up to the event, school teams hosts a variety of fundraisers — from paint parties to tag day at Walmart and a fundraising night at Hoss’s — to support the cause. Several hundred individuals, businesses, churches and local organizations chipped in with cash and in-kind donations, including food to keep the dancers energized through the night. CHAMP captains agree that this year’s final reveal, which surpassed the 2018 by $11,000, was a favorite moment. Captains presented the total to their fellow students number by number. Wilson and Mount Union Area High School captain Payton Low are seniors and while this year was their last to helm a team, they plan to return as chaperones. Smith, a junior, has one more year to go and said she’s looking forward to 2020 and her fourth year as a captain. She’ll also have to think of a new routine for next year’s lip sync battle, another favorite moment. “My sister and I put together some dance moves to try and win that thing,” she said. In addition to the lip sync battle and two rounds of Ships and Sailors, a CHAMP favorite, JVHS opened up its cafeteria for corn hole and Kan Jam competitions and welcoming students next door into the elementary school’s multi-purpose room for a three-on-three basketball tournament. Kelly Johnson, who wears several hats as a fifth grade teacher at Juniata Valley Elementary School, student council adviser and CHAMP adviser, said she remains impressed by students’ dedication to the event and, in turn, to the families they assist year after year. She said she thanks local parents for raising the next generation of community leaders. “Leadership, compassion, determination and a strong work ethic are qualities that are fostered in the home,” she said. For the last news on CHAMP, follow along on Facebook. To donate online, visit planetlovejoy.com and clock on the CHAMP button. Southern Huntingdon County High School students Andrew Shoop, left, and Jonathan Barron prepared to launch a testing projectile on a catapult made by students in district’s the new tech-ed program. The technical education department in the Southern Huntingdon County School District began its journey last March after it received approval from the school board. Before the initiative began, the shop rooms of the middle and high school laid dormant for over 10 years. In the last 12 months, the program has grown significantly, and has become a hands-on learning experience for students to apply the knowledge they’ve learned in other classes. The process began with Daniel Zimmerman obtaining his technical education teaching certifications early last year. Zimmerman has been a driving force in getting the program off of the ground and the students excited. “The amount of learning that I’ve seen with the kids, it’s just phenomenal because I’m taking the concepts that they might have learned in science or math and I make them use them. It goes from something that you’d do on a homework page to now we’re actually using these math or science equations with purpose to create something,” said Zimmerman. One of the advancements that has been made over the past year was the construction of a computer-aided drafting (CAD) laboratory for students to design projects in detail and in real time. Classes have been working on several projects, including the engineering students who have used the CAD systems and 3D printers to build basic catapults. One of the highlights of the program is the wood shop classes, which Zimmerman related they have enough interest that students had to be turned away, and it would be a full-time job for one teacher to teach wood shop every day for all sections to fulfill the demand. District superintendent Dwayne Northcraft lauded Zimmerman for his hard work throughout the year, and expressed his gratitude to the members of the community that have been helpful in making the program a success. Northcraft said the success of a program like tech-ed is due to a team environment to maximize student success across all platforms in the learning environment. He praised middle and high school principal Clint Heath for his building-wide scheduling initiative, uniting the staff to one goal. “We’re really appreciative of the work that Mr. Heath does with all of the teachers with scheduling. They’re working as an entire building to look at these courses and set up a schedule so things like this can happen. You can’t have these things happen with just a couple of people, it takes a principal that’s communicating with the staff and a lot of time for them to look at the entire school and the entire schedule,” said Northcraft. The state Department of Health recently released the results of 4,716 inspections, referred to as surveys, conducted at state nursing home facilities during 2018, which included those located in Huntingdon County. The results included those surveys conducted as routine inspections and those completed as a complaint investigation. The surveys include information on nursing home patient care and building inspections. Should a facility be cited for failure to follow regulations during the survey, a plan of correction must be submitted along with a date. A surprise follow up inspection will be conducted to ensure the issue has been resolved. Both the regular surveys and those launched by a complaint or event report are thorough. As part of the Department of Health’s most recent report, the results from surveys at both AristaCare at Huntingdon Park and Westminster Woods were included. Westminster Woods underwent a revisit survey Dec. 10, 2018, to follow up on deficiencies cited during a routine survey conducted Nov. 9, 2018. According to that report, all of the identified deficiencies were corrected in a timely manner. “They often follow up with a visit to make sure the plan of correction is being followed and that the actions support what we have documented,” said Cirignano. McAleer said deficiencies cited may be as simple to correct as a staff member forgetting to use hand-santizer. In the event issues are not addressed, the Department of Health may also issue a sanction which can include a civil penalty, a ban on admissions, a license being revoked or a facility being put on a provisional license, which requires, among other things, being inspected every six months. The provisional license can be renewed no more than three times. Both McAleer and Cirignano encouraged those with questions about the care provided at a nursing home facility to visit the site, ask questions and research online at Medicare.gov, where the most recent health inspections can be reviewed. Complaints can be made anonymously online on the Department of Health’s website, by calling 1(800)254-5164 or emailing c-ncomplai@pa.gov. April can be reached at afeagley@huntingdondailynews.com. A recent study has found that, on average, college students who receive Pell grants are 7.8 percent less likely to graduate within six years than students who did not receive the grants, according to an analysis performed by Dr. Robert Kelchen, assistant professor at Seton Hall University in New Jersey. Pell grants are federal aid offered to students with financial need. The maximum award for 2019-2020 is just over $6100. Individual amounts are based off cost of attendance, the amount of classes a student is taking and the expected family contribution, according to the Federal Student Aid website. Kelchen created the study out of U.S. Department of Education statistics by comparing six-year graduation rates of Pell recipients and non-Pell recipients across 1,266 four-year colleges, both public and private. He limited the study to institutions that had at least 50 Pell recipients and 50 non-Pell recipients, and he looked at average graduation rates starting in 2010. Out of his study, 1,097 institutions had higher graduation rates for non-Pell students, while 169 had higher graduation rates for Pell students. Matthew Damschroder, vice president of student life and dean of students at Juniata College, said Juniata College’s student body is somewhere between 20-25 percent Pell eligible. He said the college is aware of the challenges Pell recipients face. Damschroder explained Pell-eligible students often have to work additional hours to make the finances of college work. Their work may also be off campus, requiring extra hours of commuting time. “These may put additional demands on their time than other students who don’t have the same financial pressure, and to that end I think it's those sort of experiences that detract from their ability to persist and make timely progress at rates that other students do,” Damschroder said. Juniata College only has a 2 percent separation between Pell-recipient six-year graduation rates and non-Pell recipient rates since 2010: 77 percent for Pell students and 79 percent for non-Pell students. Damschroder said this smaller gap can be attributed to several factors. “If you take a look at the types of schools that are out there, small, private, residential schools like Juniata have higher graduation rates overall than their peers, (non-residential or state-affiliated schools),” he said. Damschroder explained the smaller classes offer students a chance to better learn from the professors by asking specific questions. Juniata also considers specific problems that Pell recipients may face and works to resolve those problems. For example, Damschroder explained that Juniata offers a super internship fund to provide for students who may have found an educational, unpaid internship opportunity, but cannot afford to take off work for a semester or a summer. Students can apply for the internship fund to turn the unpaid internship into a paid internship. Damschroder said these financial and time problems are the biggest difficulties facing Pell students, not a lack of intellectual skill. “Academic preparation is not one of the major concerns we are looking at for Pell eligible students,” he said. However, he explained that sometimes there may be a crossover between Pell eligible students and students who may be the first in their family to graduate college. These students may not be as willing to take advantage of extra resources, such as professor office hours or study groups. Damschroder said Juniata is constantly looking for ways to help their students. Jesse can be reached at jrice@huntingdondailynews.com. The storm that pushed through the area last night may not have brought much in the way of snow, but it did set up the area for a shot of bitterly cold air for the middle of the week. Temperatures Tuesday through Thursday won’t make it out of the mid-20s for daytime highs and nighttime lows will struggle to make it into the teens. “The average low for this time of year is 27 degrees, and the average high is around 42-43 degrees,” said Ross, noting that if this cold snap were to happen back in January, it would have been similar to what we saw this January where temperatures struggles to get into the teens for daytime highs. With the cold weather, Ross said there’s a chance for snow showers, but he noted there won’t be any significant accumulation as a result. “It’s pretty common to have snow showers, or even a snow squall farther north with this cold shot,” said Ross. By the end of the week, Ross said temperatures should be getting back to normal. “By Sunday, it will be in the 40s, and we could make a run for 50 degrees, but it could be rainy,” said Ross, noting that Sunday is the next chance for any significant participation. As far as the storm that passed through the area Sunday, Ross said the timing of the storm and the angle of the sun in the sky for March were factors in keeping accumulations down. Ross said accumulations, close to around 3-4 inches, were on par with what NWS was forecasting. The Wolf Administration recently announced Pennsylvania’s Special Supplemental Nutrition Program for Women, Infants and Children (WIC) will offer a new way for families to receive their benefits: an electronic transfer (eWIC) card, according to a press release from the state Department of Health. Previously, the state used paper checks and vouchers to deliver benefits to those enrolled in the program. However, recipients had to use the checks all at once, meaning they had to purchase all of their nutritional supplements at once. With the new eWIC cards, WIC participants will be able to buy WIC foods in as many trips as they want throughout the month, according to Nate Wardle, press secretary for the state Department of Health. The cards will also have the added benefit of shortening time at checkout by being easier to use. The eWIC cards will begin immediately for enrolled families in Blair, Centre, Clinton and Lycoming counties. This transfer to eWIC will put Pennsylvania in line with other states that have already updated, such as Virginia, Ohio, Kentucky and Colorado. Other states are also in the process of updating, such is Missouri, Illinois and Utah. The update will also include a smartphone app. “Participants will also have access to a new WICShopper Smart Phone App, which allows them to scan a product’s bar code and determine if it is a WIC-allowed food,” said Wardle.